Afghanistan's president will unveil a plan in the next eight days to offer work, education, pensions and land to Taliban fighters who lay down their weapons. Hamid Karzai intends to launch the reconciliation and reintegration plan at the start of next week's London conference on Afghanistan, although he is under pressure to announce the details earlier to help build international support. The Afghan president has also pledged to hold a new peace conference, a loya jirga, in the spring, restating a standing invitation to insurgents ready to swear an oath to the country's constitution. David Miliband promised the initiative would have international backing. "We are looking for a lead from the Afghans about the sort of institutional mechanism they want to pursue, but I'm also in close discussion with colleagues around the world about how we can make sure that there is a viable reintegration plan," the foreign secretary told the Guardian during a visit to Afghanistan to prepare for the conference. Kabul has a longstanding policy of offering to help resettle Taliban followers who defect. But the programme has been poorly funded and patchily implemented. It has failed to persuade large numbers of fighters to lay down their arms. Afghan officials say the Kabul government has learned from earlier mistakes and promise that the plan will be far more comprehensive, offering in some cases, a totally new life to the Taliban. The initiative, which was presented to senior western diplomats in Abu Dhabi earlier this month, will include jobs or land to farm, education for young fighters and pensions for older insurgents who may have fought for much of the past three decades of conflict. The package will also offer security against reprisals. "There's evidence that a lot of the insurgents are tired of fighting and are prepared to do a deal. They are fed up with the Arabs [in al-Qaida]," said one official with knowledge of the plan. "But the political signalling has to be clear and security has to be guaranteed." The incentive package will focus on alienated communities rather individuals, rewarding clusters of villages whose sons return home from the fighting. The idea is that such clusters will be strong enough to ensure their own security, and are less likely to return to the Taliban fold. In unusual cases in which security was offered to Taliban commanders at odds with their own communities, they could be offered sponsored resettlement in another area. There is some concern that overgenerosity may alienate Afghans who have not sided with the Taliban. "It is going to be a delicate balancing act between the tribes," an unnamed diplomat in Kabul said. Lt Gen Sir Graeme Lamb, a former British special forces commander who leads the reconciliation programme for the International Security Assistance Force (ISAF), has helped to design the structure of the reintegration programme. But senior ISAF officers believe the initiative is being launched too early to benefit from the anticipated impact of the current surge in US troops in Afghanistan. Western diplomats are also worried that the weak Afghan state, which is still unable to provide normal government services to most of its population, will prove incapable of handling such a complex task. Asked at the weekend about the plan, Richard Holbrooke, the US special envoy to Afghanistan and Pakistan, said it would be different from previous efforts and added: "It can't be any worse." British officials and some other western diplomats want Karzai to announce the plan ahead of the London conference so that Afghanistan's international backers would have time to digest it, before offering endorsements and funding. But an Afghan spokesman said today that Karzai still intended to wait until the conference begins on 28 January. Corruption in Afghanistan has become so entrenched that the population is being forced to pay out the equivalent of a quarter of the country's GDP in bribes, according to a UN report published yesterday. Six out of 10 Afghans view corruption as a bigger problem than violence, the dossier, compiled by the UN Office of Drugs and Crime (UNODC), found. It showed that many illicit payments – totalling $2.5bn (£1.5bn) – were made to officials in order to obtain essential public services. "Baksheesh culture" permeates every strata of society, with average bribes coming in at $160, compared to the average per capita income of $425 a year. Asked whether Afghan President Hamid Karzai should bear responsibility for this, UNODC head Antonio Maria Costa said: "We live in a society where those who are in charge bear responsibility unless they are blind." He added: "According to Afghans who have taken part in this report, it is almost impossible to obtain a public service without greasing a palm; bribing authorities is part of everyday life. During the past 12 months, one Afghan out of two had to pay at least one kickback to a public official." The report came the week before the London Conference on Afghanistan, aimed at formulating international strategy towards a country which is now causing major foreign policy headaches for the West. 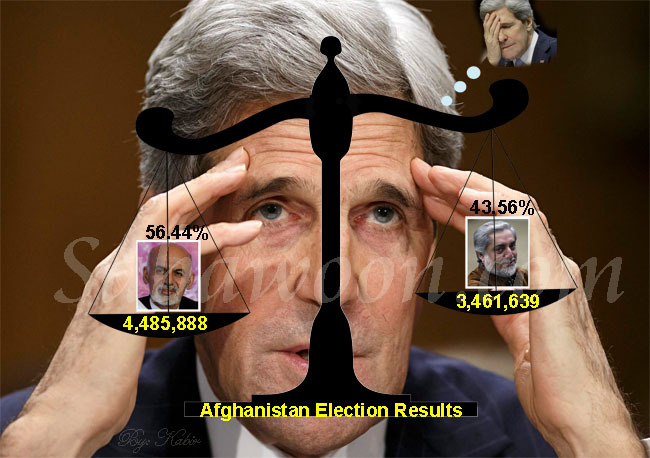 Last year's elections, in which Mr Karzai was declared victor amid claims of widespread ballot stuffing, have led to questions in Europe and the US about soldiers' lives being lost to prop up a government branded as corrupt. According to the report, policemen, judges, prosecutors and MPs were the most active in soliciting and receiving bribes. "Unfortunately, those who are supposed to be protecting the people from this sort of lawlessness are themselves seen as most guilty of violating the law," Mr Costa said. The size of the "bribery economy" roughly corresponded to that of Afghanistan's opium trade, which was estimated to be worth $2.8bn in 2009. The "explosion" in opium production which started in 2005 corresponded with the spread of illegal payments to officials and parts of the economy being swamped by "black money", said the report. Researchers found that many Afghans believed that NGOs were also involved in corruption and Mr Costa said he acknowledged that Nato forces had made payments to "shady characters" to receive information about the Taliban. He insisted, however, that paying money to Taliban fighters in an effort to get them to change sides was not a corrupt practice.